Don’t give yourself a bad name. The name of your business, product or service is one of the most crucial and yet most overlooked elements. So many businesses, products and services have forgettable or difficult to read and remember names. Your name is your first impression. It’s crucial. Why does the name of your product/service matter? In short a bad name costs you money. The easier your client can understand what you do and recall you when needed, the more you’ll sell. Your name should help the sales process, not be a hurdle. Don’t pick a name that’s personal to you or just because you like it. Your name is there to serve a purpose and help you sell. Focus on the best name for your clients. 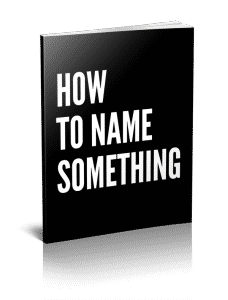 This book gives you 38 templates to create an effective name for your business, product or service. Make a great first impression and increase your sales.